Recenly retired IDF Chief of Staff Lt. Gen. Gavriel Ashkenazi called for political, policy, and social support for Israel from Israeli-Americans in his address to the Israeli-American Leadership Council in Los Angeles, at its annual Gala on Sunday March 20, 2011. Lt. Gen Ashkenazi expresses pride in IDF strength and ethics. He offers recommendations on how civilians can help Israel defeat the forces which oppose it - particularly the campaign to delegitimize Israel's sovereignty and the threat from nuclearizing Iran. Lt. Gen Ashkenazi attested a personal commendation for Israeli Leadership Council Executive Director, Shoham Nicolet, recognized during his days in uniform. Los Angeles Jewry held a memorial to the Jewish family of Rabbi Ehud & Ruth Fogel and their 3 children, slain by Palestinian terrorist hands in their home in Itamar, Samaria on Friday 11 March 11. The event was held Thursday 17 March '11 at Temple Bnai David Judea, officiated by congregational Rabbi Joseph Konefsky and organized by Fogel-family acquaintance, Shlomo Mirvis of Bnai Akiva. Mirvis presented this eulogy of a family so piously Zionistic that they hosted in their home a Bnai Akiva Oneg Shabbat of 30 children. Mr. Mirvis adds that Rabbi Ehud, though exempt as a father of 6 children, chose to serve his people's defense one-month annually in the Israel Defense Force reserves. In this JooTube exclusive video, Museum of Tolerance's Rabbi Marvin Hier warns Palestinian slayers of the lambs of the G-d of Israel that history has shown that their acts against the G-d of Israel are wicked, immoral, futile, and will eventually backfire onto them. Roz Rothstein, Executive Director of StandWithUs, denounces the slaughter of 5 Fogel family members by the 'premeditated evil and hate' advocated by Palestinian leadership against Israel. Mrs. Rothstein portrays the Islamist crusade against Israel as an objectionable continuation of the Nazi movement against the Jews - which ultimately results in strengthening Jewish resiliance. Five members of an Israeli family were slaughtered Friday night when a Palestinian terrorist broke into their home in the West Bank settlement of Itamar and stabbed them all to death. The innocent victims were Rabbi Udi Fogel, his wife Ruth, and three of their children Elad, Yoav and Hadas. Responsibility for the attack is claimed by the “moderate” side of the Palestinian political spectrum, the Brigades of Al Aqsa, the armed branch of Fatah, founded by Marwan Barghouti. Word has it that a meeting has also been held in Khartoum by members of Hamas and sundry Muslim Brothers, attended by Palestinians, Egyptians, Tunisians and even English people: they supposedly coordinated a large-scale international plan for Islamic terrorist attacks to be headed by Iran, the primary target of which would be Israel. The background to the attack carried out the other night is on one side that of the revolution occurring in the surrounding Arab countries, and on the other side that of the most traditional form of hatred. The leadership of Abu Mazen and Fayyad is in a state of alarm, which led both of them to adopt aggressive, unwavering attitudes toward Israel in a bid to win over the masses who are threatening their power on Internet and out in the streets. They call Abu Mazen the slave of Israel and of the Americans and their campaign has been dominated by the call for unity with Hamas. The social networks act as a sounding board, praising the “resistance” and rejecting any peace projects, including the largely unknown new interim project which Netanyahu intends presenting at Washington to facilitate a return to the negotiation table. At any rate, Abu Mazen and Fayyad have already said they are not interested. They also issued indignant denials of stories revealed in the "Palestinian papers", which actually only stated that negotiations were underway with Olmert’s government. Current opinion has it that to be a pure and real Palestinian, you cannot be involved in negotiations and therefore they deny any evidence, even of speaking with the Israeli. As a matter of fact, the Palestinians have no intention of negotiating for "two States for two people": to them, Palestine is a single entity that includes Israel. Mrs. Janet Parshall calls anti-Semitism "a sin, pure and simple";' calls Christians to unite to fight anti-Zionism, anti-Semitism and to defend the Jewish people, in honor by Christian Zionist group, Proclaiming Justice to the Nations group at National Religious Broadcasters confab in Nashville this week. Radio personality, Janet Parshall, declares anti-Semitism "a sin - pure and simple" in accepting the Christian Zionist PJTN group the Ed McAteer Tree of Life Award from activist group, Proclaiming Justice to the Nations / PJTN. Founded by Laurie Cardoza-Moore, PJTN named the Tree of Life Award after Ed McAteer, who called on Christians "to honor Israel, to pray for the peace of Jerusalem, and to express their unconditional love for G-d's ancient people." Ms. Parshall denounces the Boycott, Divestment, and Sanctions ("B.D.S.") movement and false libels of apartheid in Israel. She implores Christians to "never be silent" regarding the new wave of anti-Israeli, anti-Semitism. Jewish organizations are hailing Pope Benedict XVI's unequivocal repudiation of the claim that the Jewish people can be held forever responsible for the death of Jesus. The Vatican already rejected the claim in general terms in 1965 with the landmark Nostra Aetate document issued by the Vatican II Conference, opening the door to formal Catholic-Jewish dialogue. But in a new volume of his book, "Jesus of Nazareth," Benedict employs a detailed scholarly analysis of Catholic teaching to make the point clear. The Anti-Defamation League called it “an important and historic moment” in Catholic-Jewish relations that would build on Nostra Aetate. Excerpts of the book, which is due out March 10, were released Wednesday. "Now we must ask: Who exactly were Jesus' accusers? Who insisted that he be condemned to death?" 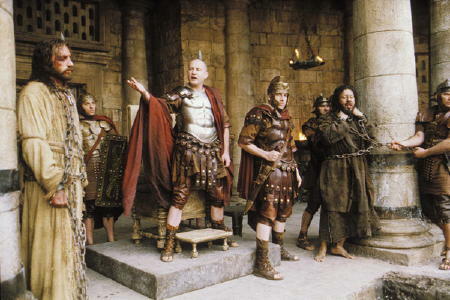 Benedict writes in a passage regarding Jesus' condemnation to death by Roman governor Pontius Pilate. Noting that the Gospel of St. John states that it was "the Jews," he asks, "How could the whole people have been present at this moment to clamor for Jesus' death?" John's use of the term, he writes, "does not in any way indicate -- as the modern reader might suppose -- the people of Israel in general, even less is it 'racist' in character. After all, John himself was ethnically a Jew, as were Jesus and all his followers." What John meant by "the Jews", Benedict writes, was the priestly "temple aristocracy." In another passage, Benedict explicitly rejects the notion that the expression reported in the Gospel that "His blood be on us and on our children" meant an eternal curse against the Jewish people. Instead, the pontiff writes, "It means that we all stand in need of the purifying power of love which is his blood. These words are not a curse, but rather redemption, salvation." Elan Steinberg, vice president of the American Gathering of Holocaust Survivors and Their Descendants, said the pope's book marked "a landmark moment" in Catholic-Jewish relations. "Pope Benedict's theological repudiation of the deicide charge not only confirms the teachings of Vatican II, which formally rejected collective Jewish guilt, but seals it for a new generation of Catholics," Steinberg said. Pope Benedict XVI lets Jews off the hook for Jesus' death, the 2012 Olympics logo angers Iran, and John Galliano covers Jewish affairs from Paris.